I'll update this post throughout the day, so check back to see what's going on. 8:35 am: We're in the waiting area at Dell Children's Medical Center now, and they took Carter back about half an hour ago. He did fine overnight. I woke him up at 2:00 to give him a bottle and he had almost 3 ounces. I woke him up again at 4:00 to give him a bottle of pedialyte, and he drank 2 ounces of that. He scrunched up his face at first, but then he sucked it down. He's never had anything but breastmilk in his whole life, so I'm sure he was wondering what that was about. Of course, he drinks it with iron in once a day and that stuff is nasty, so I guess he's not too picky. :-) He was fine until about 7:15, and then he started to get fussy. DCMC is a brand new facility, and it's really nice. The architecture is sort of quirky, and the art and decor are definitely kid-friendly. There are lots of bright colors and interactive displays. We arrived here at 6:30 and got Carter checked in. They took us back to a small room and took his vitals, and then I put him in a little baby hospital gown. It was way too big for him, but it was the smallest one they had. We met with three different nurses and the anesthesiologist, who told us that the first thing they do is give him an anesthesia gas to put him to sleep, and then they put his IV in. I'm so glad he won't be awake for that! The surgeon came by to see us after that. He said the surgery should be about an hour, so they should be more than halfway done at the time of this post. When it's done, the surgeon will come to talk to us while Carter is wheeled into recovery. Once he's awake, they'll let me come back and nurse him. Eventually they'll move us to a room, where we'll stay until he's released tomorrow. The nurse and anesthesiologist came to take him back around 8:00, and it was weird to hand my baby over to someone else. We watched as she carried him back through the double doors to the surgical unit, talking baby talk to him the whole time. He wasn't crying or anything; he just seemed curious about what was going on. It's weird to be here with Doug and no Carter. It's weird to think that right now my tiny baby is being operated on. But somehow it hasn't been that nervewracking or upsetting for me. 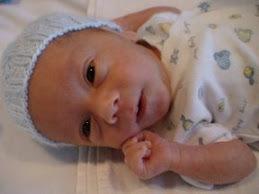 I think all those weeks in the NICU provide a lot of perspective, heh. 9:35 am: We just met with the surgeon, and he said that the surgery went fine. He said that the hernia on the left side was very big and that part of the intestine was stuck in the groin canal. He said that one had taken some work to fix, but that the repairs were successful. Carter was still in the OR when he came to talk to us, apparently coming out of anesthesia slowly -- something that is common for preemies. They'll take him to recovery soon and will call us back there when he's more awake. 11:00 am: Still waiting. I went up to the front desk to ask for an update about 10:30, and the attendant called back. The nurse said he was still sleeping and they would let us back there when he wakes up. Hmmm. I'm not sure why we can't go and sit by his bed, but hopefully it won't be much longer. 11:45 am: Okay, I just spent about half an hour with him and then let Doug go back. (There's only one parent allowed at a time in recovery.) He's been having some apnea (breathing slowing down or stopping) episodes, which is why he's still there. He isn't bradying (heart rate drop) with the apnea, which is good. He opened his eyes for me and started to seem a little hungry, so I gave him some of a bottle I'd pumped for him. He took about an ounce and a half, but his breathing rate kept dropping, as if he was just forgetting to breathe. I would tickle him and stimulate him a little, and it would come back up. The nurse seemed impressed that I was so calm about it, heh. He was tired after the bottle and started having more apnea, once slowing down so much that the nurse and I were both stimming him. This sort of thing is apparently common for tiny babies, especially preemies. He'll stay in recovery until he's stabilized, and then he'll go to intermediate care. I'm not sure if he'll be moved to a regular room today or not. Hopefully he will be, because I'm not sure if I can stay with him in IMC. At this point, they aren't sure if he'll be able to go home tomorrow morning. It may be later in the day. He has an IV in his thigh and monitor leads stuck to his chest and an oxygen sat thingie on his hand. It's oddly reassuring to be able to look up at the monitor again and see what's going on. I thought I'd never want to see one of those again, but I forgot how helpful they can be when you know what you're looking at. It's also strange that he suddenly looks so big. I think it's because the last time I saw him hooked up to things he was so tiny and skinny. Now he's all big and chubby, and the monitor leads look smaller than I remember. And I'm finding myself back in "NICU mode" -- I'm uber-calm, very matter-of-fact, asking lots of questions, and not really freaked out by any of it. I thought it might be hard to see him with an IV and everything, but so far it hasn't been. I've seen him worse, I guess. He cried a couple of times in a way that says he's in some pain, but it was brief and oddly silent. I think he's just too sleepy to cry properly yet. So it's a bit rougher than we were expecting, but he should be fine. I'll update again when he's out of recovery. Jenn - Glad to hear that the surgery went well. We are sending little prayers from NC that he continues to recover well from his surgery. Hopefully he will be ready to go home tomorrow. I hope you guys have a good night.